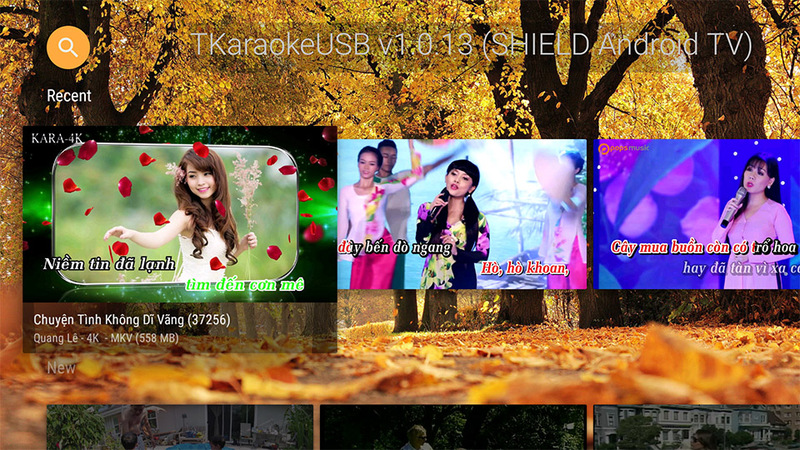 TKaraokeUSB is similar to TKaraoke Pro but instead of running on a computer, it runs directly on your TV or Android Box. TKaraokeUSB is designed with simple user interface so it is ideal for non-technical users. If you don't already have a Sony TV, you'll need to buy an Android Box. Fortunately, Android boxes are cheap and yet powerful. I recommend getting the MiBox. The MiBox can run TKaraokeUSB fine and can handle 4K songs. Buy it from Walmart for $69. In the MiBox, run the app Google Play Store and search for TKaraokeUSB. Then select to install it. 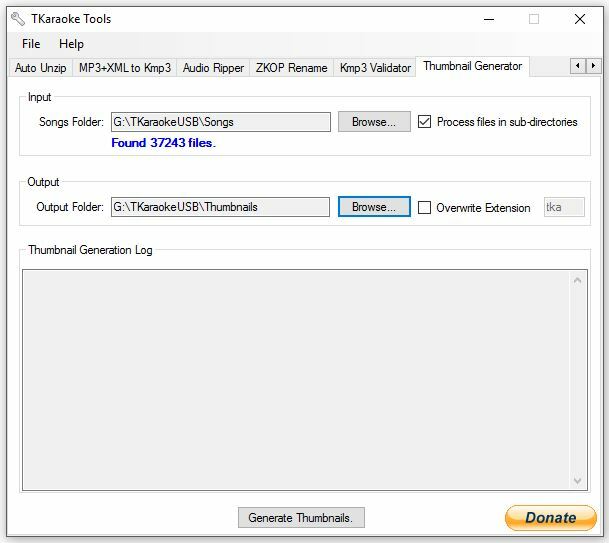 TKaraokeUSB is a free app so you can just install it w/o paying anything. There are many ways to setup the hard drive, I recommend set it up as follows. At the root of your hard drive, create a folder called TKaraokeUSB. In this folder, create a folder called Songs and put your songs in there. Also download the attached tkaraoke.txt file and save it in the TKaraokeUSB folder. Also in the TKaraokeUSB folder, create an empty folder called Thumbnails. Your Songs folder should contain your songs collection. You can define song categories by creating Name.category files and place them in various folders in your songs collection. See this page for more details. Preparing the thumbnail images (preview image for each song) is optional but recommended. When you use TKaraokeUSB, it will generate the preview image for each song and show this image together w/ other song info such as Song Name, Singer Name, File Size. If you provide the song preview images as part of your collection, it will help avoid having to create these preview images on-the-fly. You can use TKT to prepare the thumbnails folder in just a few clicks. In TKT, go to the Thumbnail Generator tab, select the Songs folder for the input and the Thumbnails folder for the output. 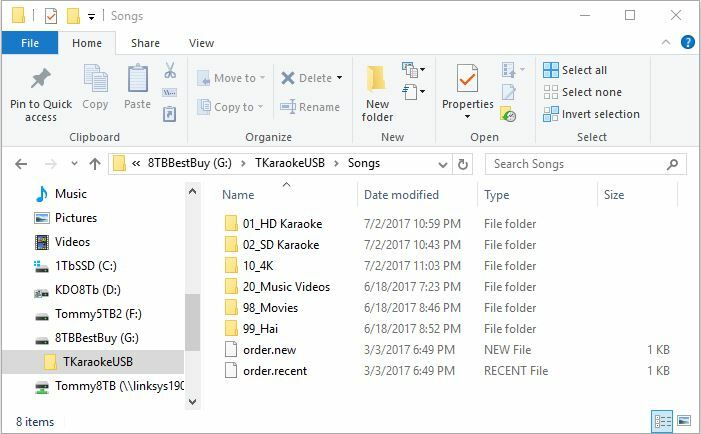 It is important to only put the Thumbnails folder right next to the tkaraoke.txt file and not in other places. Connect your hard drive to your Android Box via the USB port and run TKaraokeUSB. If it is your first time running, it will ask you to give Storage Permission. This is because TKaraoke needs to read your hard drive to play the songs. Select Allow to continue. If anything goes wrong (such as TKaraoke can't find any song), the info will be shown on your TV so keep an eye on the TV screen. 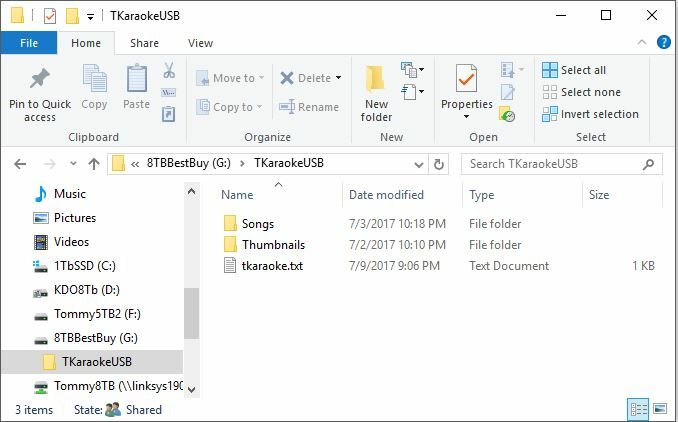 If you made changes to your song collection, select Hard Exit in TKaraoke and start TKaraokeUSB again. Hard Exit will force TKaraoke to rescan songs on the next run. TKaraokeUSB supports voice search using your device's remote. To activate voice search, while TKaraoke is running, press the microphone button on your remote once (only press, do not hold the microphone button) and wait for the microphone icon in TKaraoke to turn red. Then speak what you want to search into the remote. The default language might not be Vietnamese so if you see that it doesn't recognize Vietnamese, exit out of TKaraoke and go to Settings => Speech and change Language to Vietnamese. Then start TKaraokeUSB and try voice searching again. Note that you can voice search both when TKaraoke is at the main screen or when TKaraoke is playing a song. After you stop speaking, the search will start and all matching songs will be shown. Use the Left/Right button on the remote to select the right song and press the Enter button to select. To dismiss the search result, press the Back button. 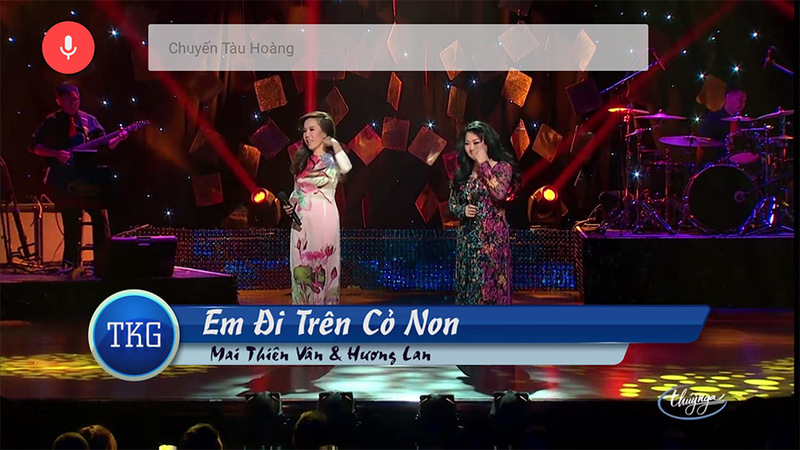 As an example, I was trying to search for Chuyến Tàu Hoàng Hôn. As I speak, it will recognize each word. Right when the screenshot below is taken, I have spoken 3 words so it recognized "Chuyến Tàu Hoàng" and the microphone icon is still red indicating that it is still listening to pick up my 4th word (Hôn). Without registering TKaraokeUSB, it will only load the first 1000 songs on your hard drive. To register, buy the key online and in TKaraoke, go to Settings => Register and select the item "EnterYourKey". Then click Next to register. After a few seconds, it should display a message "Registered, all features unlocked". Next, select Hard Exit in TKaraoke and start it again. tkaraoke.txt (1kb) downloaded 176 time(s). order.new (1kb) downloaded 152 time(s). order.recent (1kb) downloaded 144 time(s). Does this beta version allow mapping from a network drives? The beta version was closed. What you saw on the Google Store is a production version. You can use network drive if Android allows you. On Nvidia Shield's Android 7, you can do the mapping under Settings => Storage & Reset. Why is this usb version free? How do i queue song? Can it connect to ur vip songs server? TKaraokeUSB is available for free on the Google Store. The next build will limit to 1000 songs. To remove the limit, you would have to buy a key (similar to a Pro key). Pro users will get 50% off coupon. TKaraokeUSB can't connect to the VIP server or local server, it will only read from USB hard drives or network drives. Not sure if this is an issue with tkaraokeUSB or Nvidia shield, but after going into setting -> storage & reset -> I was able to successfully mapped to a network drive connected as register user. One thing I noticed is that in your demo video, all the drives inside your mounted drive would display storage capacity (for example, 2tb, 4tb, 8tb..etc) where as mine just show as "calculating" and would not display storage capacity on each drive. When launching tkaraokeUSB, a message stated that no hard drive is detected, please connect USB hard drive. Can you help me out with this? Thanks HL. Don't worry about the size showing up as "calculating". I think your issue is the tkaraoke.txt file is in the wrong place. TKaraoke will only look at tkaraoke.txt on the root folder or first-level sub folders. For example, if your hard drive is D:\ and you put the tkaraoke.txt file under D:\TKaraokeUSB\tkaraoke.txt, then when you share the drive on Windows, you want to share the folder D:\TKaraokeUSB and not the drive D:\. This is because Android will append the computer name to the share name, making it one sub-folder deeper. In the above example, say the computer where you shared the drive has host name "MyDesktop", then android will mount the share drive as "MyDesktop/TKaraokeUSB". If you share the drive D:\, then the mount point will be "MyDesktop\D" and your tkaraoke.txt would be in MyDesktop\D\TKaraokeUSB\tkaraoke.txt. This is 3 levels deep and TKaraoke will not consider this mount point when scanning for songs. I see, yes I only share drive D:\ instead of folder D:\tkaraokeUSB. I'll try it again tonight and let you know how it go. Thanks for the prompt response. I was able to successfully mount network storage and tkaraokeUSB can now detect songs on my share drive. However, it only limit to 1000 songs. I thought this was suppose to be enforced on next build? I'm on build 13 now.